Here on Arran the Greylag Goose is by far the most numerous on the island, with flocks of up to five hundred in the Shiskine Valley and at the south-end round Sliddery and Clachaig in winter. This is a small number in comparison with for example the 35,000 Barnacle Geese which winter in Islay. The Greylag Goose is probably the most familiar of all the geese seen in Britain. It is the only native wild goose breeding in Britain. In addition it is the species from which most farmyard geese were bred. The big deep-based bill, pink or orange, is an eye catching feature plus the pink legs. The Greylag Goose is also bigger, bulkier and paler than other grey geese. In particular the head, neck, chest, belly, upper-wing, under-wing and rump can all look conspicuously pale grey, making flight identification relatively easy. According the Wildfowl and Wetlands Trust two populations of Greylag Goose occur in Britain. A migratory population breeds in Iceland and winters predominantly in northern Scotland, with smaller numbers in eastern Scotland, northern England, Ireland, southwest Norway and the Faroe Islands. A largely sedentary population also exists, which occurs in much of Britain particularly on the Hebrides, the north and west Scottish mainland, Orkney, Shetland and throughout large parts of south and east England. The sedentary population has expanded its range greatly in recent years, and now overlaps with migratory birds during the winter. Both populations are present on Arran. As geese move from one area to another the sight and sound of chevrons of flying geese is a feature of a winter's day. Take a moment to watch and listen as they pass overhead or as they prepare to come into land. As they come into land you may see them whiffle. Whiffling is a term used to describe the behaviour whereby a bird rapidily descends with a zig-zagging, side slipping sort of motion. It is almost as if they are spilling the air out of their wings. Sometimes a bird will even fly briefly with its body turned upside down but with its neck in a normal position, as shown in the photograph. The aerodynamics which usually give a bird lift during flying are thus destroyed and the bird briefly plummets toward the ground before this is quickly reversed and the bird adopts a normal flying orientation. 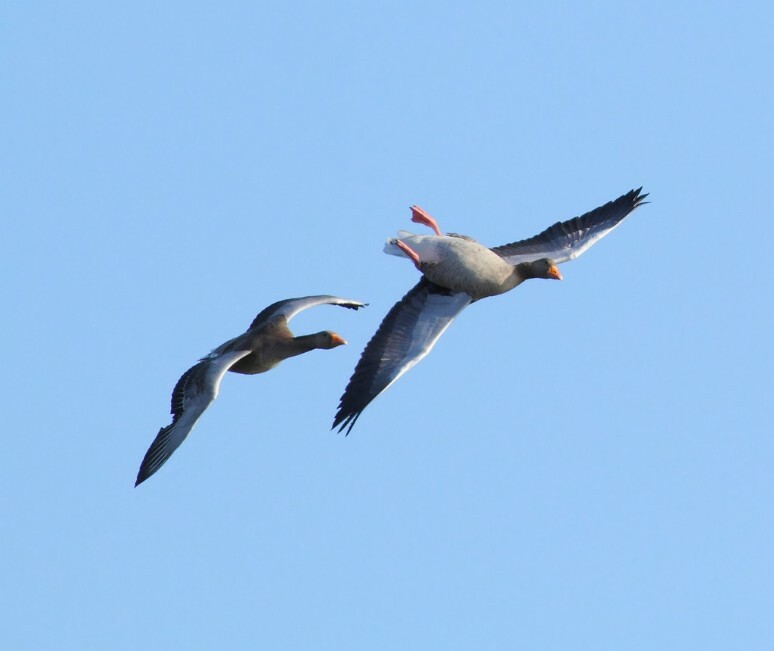 This erratic motion resembling a falling leaf may be used by the geese to avoid a long, slow descent over an area where wild fowling is practised and they could be shot, or maybe the geese whiffle because it is fun.